To make vegan béchamel, melt margarine in saucepan. Whisk in flour, then slowly whisk in warm soymilk in a steady stream. Stir in nutritional yeast, nutmeg, and salt and pepper to taste. Preheat oven to 200°C/400°F. Peel onion and garlic, clean mushrooms. Finely chop onion, garlic, and thyme and slice mushrooms. Add oil to frying pan and sauté onion and garlic over medium heat until fragrant and softened. Add mushrooms and thyme and cook for a few minutes, until mushrooms start to brown; if needed, add a bit more oil. Add spinach and cook until wilted, stirring often. Season with salt and pepper. Set aside. Spread a layer of tomato sauce on bottom of casserole dish. Add a layer of noodles, then a layer of béchamel sauce, and a layer of vegetables. Top with another layer of noodles and tomato sauce, and repeat pattern until casserole dish is filled. 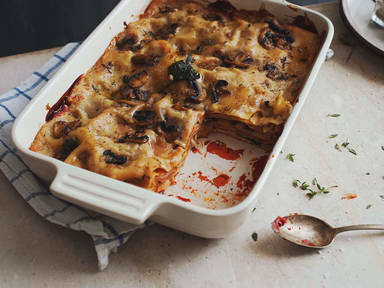 Finish with a layer of béchamel sauce and remaining mushrooms and spinach. Garnish with thyme leaves. Bake for about 30 – 40 minutes at 200°C/400°F, or until sides start to bubble and top turns golden brown. Let cool slightly before slicing and serving. Enjoy!